Molson Coors Brewing Company (NYSE:TAP): Are Hedge Funds Right About This Stock? Is Molson Coors Brewing Company (NYSE:TAP) an exceptional investment today? Money managers are betting on the stock. The number of bullish hedge fund bets moved up by 12 lately, and the company was in 32 hedge funds portfolios at the end of the third quarter. In spite of this recent bullishness, the stock was not one of the 30 most popular stocks among hedge funds. “Molson Coors Brewing Company is the challenged number two brewer in the US and Canada, owning brands such as Coors and Miller. The company has lost significant market share due to the spectacular growth of craft beer and imports from Mexico, and sales have been falling. The market has seriously penalised the company for this, with the stock down around 45% from its 2016 peak, and now trading at a highly discounted valuation of around 10 times its cash earnings. Now, let’s view the key hedge fund action regarding Molson Coors Brewing Company (NYSE:TAP). What have hedge funds been doing with Molson Coors Brewing Company (NYSE:TAP)? Heading into the fourth quarter of 2018, a total of 31 of the hedge funds tracked by Insider Monkey were long this stock, a change of 63% from the second quarter of 2018. 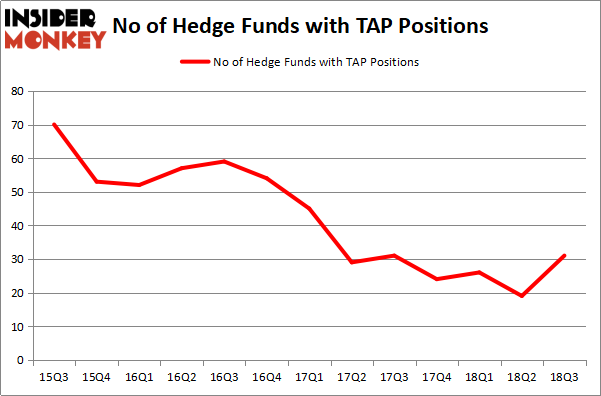 Below, you can check out the change in hedge fund sentiment towards TAP over the last 13 quarters. 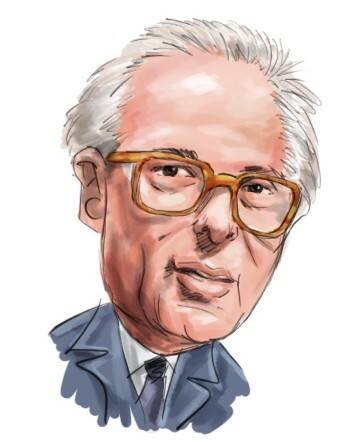 With the smart money’s positions undergoing their usual ebb and flow, there exists a select group of key hedge fund managers who were boosting their holdings considerably (or already accumulated large positions). Among these funds, Arlington Value Capital held the most valuable stake in Molson Coors Brewing Company (NYSE:TAP), which was worth $102.7 million at the end of the third quarter. On the second spot was Diamond Hill Capital which amassed $80.5 million worth of shares. Moreover, Millennium Management, Citadel Investment Group, and D E Shaw were also bullish on Molson Coors Brewing Company (NYSE:TAP), allocating a large percentage of their portfolios to this stock. Consequently, some big names have been driving this bullishness. Millennium Management, managed by Israel Englander, assembled the most valuable position in Molson Coors Brewing Company (NYSE:TAP). Millennium Management had $66.5 million invested in the company at the end of the quarter. Jim Simons’s Renaissance Technologies also made a $33.6 million investment in the stock during the quarter. The other funds with new positions in the stock are Joel Greenblatt’s Gotham Asset Management, Matthew Tewksbury’s Stevens Capital Management, and Kerr Neilson’s Platinum Asset Management. Let’s now review hedge fund activity in other stocks similar to Molson Coors Brewing Company (NYSE:TAP). These stocks are Alliant Energy Corporation (NYSE:LNT), Cabot Oil & Gas Corporation (NYSE:COG), American Financial Group, Inc. (NYSE:AFG), and Iron Mountain Incorporated (NYSE:IRM). This group of stocks’ market valuations resemble TAP’s market valuation. As you can see these stocks had an average of 23 hedge funds with bullish positions and the average amount invested in these stocks was $450 million. That figure was $557 million in TAP’s case. Cabot Oil & Gas Corporation (NYSE:COG) is the most popular stock in this table. On the other hand Alliant Energy Corporation (NYSE:LNT) is the least popular one with only 20 bullish hedge fund positions. Compared to these stocks Molson Coors Brewing Company (NYSE:TAP) is more popular among hedge funds. Considering that hedge funds are fond of this stock in relation to its market cap peers, it may be a good idea to analyze it in detail and potentially include it in your portfolio.